Please see the attached xml and let me know is it ok now? 1) Because on a 64 bits computer if this value is OnError, the Windows 7 x86 is installed automatically. We need to choose between x86 or x64 bits versions. To do this, change this value like above for x86 and amd64 inside Autounattend.xml file. Always: Specifies that the UI is always displayed. Like this your Autounattend.xml file will be good! please help me in this as well. Could you attach your new Autounattend.xml file! sure mate, here is my latest xml. You can check with WSIM! *Edit: post updated with a new Autounattend.xml and a new computer name whithout space! Wow thanks mate, you are really a life saver, I just tried your xml and its fine atleast in wsim, now I would test it with my multiboot OS and let you know. I have already checked you have already changed this "Microsoft-Windows-Security-Licensing-SLC-UX." to "Microsoft-Windows-Security-SPP-UX" in the xml which you have given to me. OK! But it's not the same problem. I've updated my post #126 above with a new Autounattend.xml (x86 and amd64) for you! The trouble was that no empty space (gap) are supported for the computer_name, I renamed "Win7_Vaio". But you can change if you want, of course! Thanks to tell if you have errors! I've tested with my settings and all is fine! Ok thanks mate, I will try the new xml in installation and let you know who it goes. 1) It is possible to merge 2 command line in the same SynchronousCommand? 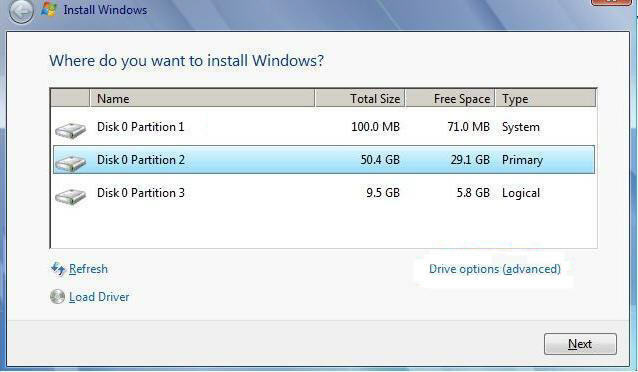 2) At Win7 installation start, It ask for the partition (in my case System, Primary Logical) where to install Windows (see here image bellow). What the System partition (100MB) used for? How to parameter Autounattend.xml to ignore that System partition (100MB)? Don't think you can combine that but I haven't tried. If you use Bitlocker you need the 100mb. You can wipe out part2 and extend the 100mb out. I'm guessing part3 is a backup location? If I well understand the commandLine will looks like bellow. Isn't it? Regarding the partitions, the part 3 (logical) is for my silent progs test. Anyway I never used Bitlocker before and don't think using it once. Then, to wipe part1 (system) do the following is correct? May you please give an exapmle how looks yr cmd file in Synchronous?